The eight of us have gathered at the stone spiral labyrinth overlooking the wide valley below the eastern Sangre de Cristo mountains, in the chill just before dawn. Silently moving around the labyrinth to a drumbeat, we wait at the center for the sun to emerge over the mountains. As it peers out, we sing the ancient welcoming songs to the radiant orb that sustains our tribe’s life. A hawk cries overhead – a good sign. We end with a warm group embrace, and then carry the precious gift of our connection back around the labyrinth. Still in silence, we arrive at Thunderbird Hall, receive purifying smudge, and take our places on mats around the ceremonial circle. We prepare ourselves for the ritual trance posture with prayers and meditation. Grandfather Drum begins sounding, deep like thunder, in a steady heartbeat. We each take the chosen posture — one used by Jivaro Indians to induce trance to enter into mother earth, home of the animal world. Behind my closed eyes, I sense that the pounding drum has become a large, heavy grey sphere. From underneath emerges the snout of an animal. She has dark soft eyes and nose and striped markings. She looks at me, pleading and sweet. I think “Antelope,” and immediately her long delicate limbs emerge, as well as the small horns. She gambols and prances for me, showing off – free at last. She goofs like a cartoon creature, boxing with her tiny hooves. She is ecstatic, glad to be welcomed back from obscurity and maybe extinction. I feel her delight within myself, and I promise to give her life again. Antelope makes ritual bowing moves, front legs splayed out, head down. I recall deer dances of the local pueblos: the individual dancers’ careful steps, the inner focus – with total awareness on unity with the other dancers. It is an ancient dance, renewed each year in the appropriate season. The drumming slows and stops. I peek out from under the antelope’s silky eyelashes and return to awareness of the humans gathered here. We begin to write in our journals and then share our stories around the circle. Instantly I know why I have received this vision. That roaming antelope, that’s my young self – running free in the mountain meadows of Colorado, gamboling with my mates under a blue sky, nuzzling and resting with them through the night with stars and meteors for company. We are wild but not “wild and crazy:” serene, alert, quick, responsive. I have found my herd, my tribe, and I celebrate coming back to my nature-loving self and returning home to mountain country again. Having grown up in Colorado under big skies, then lived in exile on both coasts, I am finally back in my native habitat, living in Santa Fe at the tail end of my beloved Rockies. I have come through seven years of illness, trauma, and recovery, and now it is time to PARTY. The Institute’s 470 acres of juniper and dry hills preserves the bones and stones of a large pueblo abandoned sometime in the terror of the Spanish conquistadores. The village has never been excavated, so the land itself evokes memories and stories that reinforce our experience of being connected to a long human history. After several days of ceremony and ritual designed to allow our unique animal spirits to emerge, we begin to prepare for our group trance dance. We will enact it at dawn on the last day, all of us creating a drama weaving together our individual animal dances. We will make costumes and masks together. We have brought scraps of fabric and leather, bags of feathers and wool, spools of ribbons. There are boxes of thrift-store clothes and tempera and glitter paints. A sewing machine and a glue gun sit ready. I think of my failed grade-school art projects and wonder how I will ever do this. But now I am a brand-new antelope kid, thrilled to have the chance to play. I am re-making the story of my adolescent self, bookish and shy, so not a herd animal. Now I cannot wait to make my beautiful dress for the coming out party I never had. The tribe gathers to make our costumes. Our fabrics and beads and feathers are flung about the common room, which looks like a massively disorganized version of the Project Runway workroom. On one end of the dining table, one fellow is carefully drawing his Coyote mask onto plywood, then cutting it out, assembling it, and painting Haida Indian design elements on its long snout. On the other table, the French woman, who teaches crafting, is felting parts of her Penguin costume from soft hunks of wool. At the sewing machine is a professional costume designer; she is modifying a wild feathered headdress into its new Serpent Woman incarnation. I make a drawing of my antelope and list out the materials I’ll need, and then scrounge around to find most of it. The carpenter helps me cut out my curved mask from some large tubes. I find an old pair of beige knit pants that will be my hind end, thighs covered in white lacy Ralph Lauren place mats which I will stitch on. My forelegs will be bony white sticks of juniper, held in hands gloved in long white socks. The antelope represents to me the joy of living in nature all year round, night and day. She gets to witness the arc of the sun as it crosses the sky, then the arc of the moon as she floats through the star-decorated night sky. Therefore, I must wear a round crown that has the glittering night sky on the front and the sun-brilliant day sky on the back. I absolutely must have rhinestones and narrow bright ribbons for my crown. My eyeballs will float out on the sides of the head, so to make them I must wrap Styrofoam balls in soft black fabric. I need black poster board to cut out my long eyelashes. Several of us make a lightning raid on the Walmart in Espanola, with a 20-minute deadline. I find exactly what I need. This whole process is beginning to feel a bit miraculous. Synchronicities happen. As soon as I identify a need, it is met. I learn how to use a glue gun to attach the rhinestones and gold planet rings to my crown … and to fix the brown suede scrap to my mask forming a long nose and small horns. The costume maker shows me how to attach the crown to the mask. The craftswoman from France helps me strap it together so the mask stays steady on my head. I add tiny lips and paint the white face beautifully with stripes of apricot paint. I get more ambitious as I gain confidence. I construct a leather medicine pouch hanging around my neck to carry all the elements of nature that make me whole. I find another perfect odd scrap of soft brown suede, fold it together, and learn how to punch holes in it for the leather thong. I fill it with carefully chosen stones and bits of plants and flowers, and twist a narrow aqua river of ribbon around it. It is so lovely, and I am so proud. I begin to practice my prance dance. 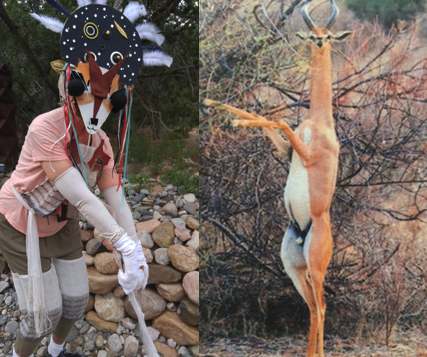 Soon the eerie sense comes over me: I know how it feels to be a teenage girl antelope. I rotate my head from side to side to notice potential predators – and check out who might be watching me. I step daintily, four hoofs in a line. Now I am showing off for my new friends. Sometimes I get a notion to “frisk” – bouncing up and down and giving a flirtatious shake of my white tail. When I hear a snap of a twig, or clack of scissors, I stop dead. It is a memory and pleasure buried deep in my ancestral psyche. Now I understand, in body and soul, what a satisfaction it is to belong to a tribe. 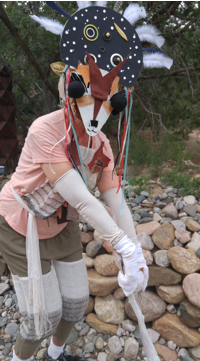 The facilitator, Paul Robear, has spoken with each of us about our evolving animals, and has woven together the skeleton of the dance to be performed early on Sunday morning. We do a quick run-through on Saturday. Some of us stay up late, late that night, scrambling to finish and clean up the workroom. On Sunday around 5:30 am, we put on our costumes and receive blessings as we enter the Kiva. There our masks are arranged beautifully around the center of the circle. We put them on, and then go outside to begin the trance dance. Our dance ends at the Thunderbird Hall. We shake off the trances, take off our masks, and go back for breakfast and a sharing circle. We say farewell to each other with hugs and big grins. For me, the whole week had been the dance: the artful sequence of events that helped us come together in a harmonious way to create a satisfying ritual. Since then, I have truly come into my deeper self as a playful human animal being, feeling right at home in the mountains and deserts of the southwest. I have been more open to spontaneous ecstatic experiences of connecting with nature. And I can’t wait to greet my tribe of friends at this year’s Trance Dance. Postlude: Since I identified my “inner antelope,” I have had my eye out for images of antelope in indigenous cultures. Apparently I was tuning into an archetype. I discovered that antelope is beloved and sacred in at least two cultures: Native American pueblo, and African. The Hopi have an Antelope Society, one of only a few Hopi religious orders to include women as well as men. 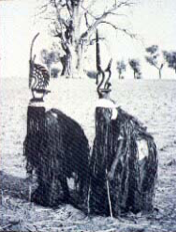 Other Pueblo tribes also have an Antelope Dance among their tribal dance traditions. At Hopi, members of the Antelope society participate in the elaborate multi-day snake dance ceremony. Both Antelope and Snake represent rain and growing of crops. On three mornings, just before dawn, in the Antelope Kiva, is held the symbolic marriage of Tiyo, a youthful hero, and the Snake Maiden. 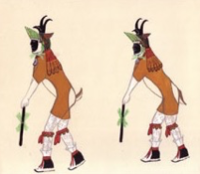 Hopi antelope dancers wear a curved green crown in front of the horns. The Antelope priest dances with green vines around his neck and in his mouth – just as the Snake priests will later do with snakes. On another continent, the Bambara and Dogon tribes of Mali believe that the Antelope taught the people to farm, because the horns look like digging tools. 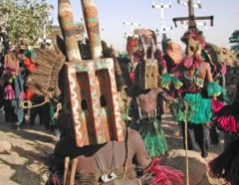 Bambara horned headdresses are beautifully carved – a collector’s art form.